Those were the first words out of Jason Helder's mouth after the final card came out to deliver him the title in the 2014 WinStar River Poker Series Main Event. A million dollars. Freedom. Helder, who plays online under the name teamwispy, started off strong at the final table and never looked back. "It's my biggest score by five times ever," Helder told us while posing for pictures with his newly won bracelet. "Having position on Travis Rice and Kevin Eyster was huge for me. I didn't make any big mistakes and chipped up early." When asked what he was going to do with the million dollars Helder laughed and said "I don't know yet. Winning is the hard part... spending is the easy part." Helder's off to play the World Championship of Online Poker and will do so with a comfortable bankroll. Play started today with ten players looking to take home a seven figure payday. Well-known professional David "ODB" Baker would be the first player eliminated when he had the misfortune of running into the Khoa Nguyen. 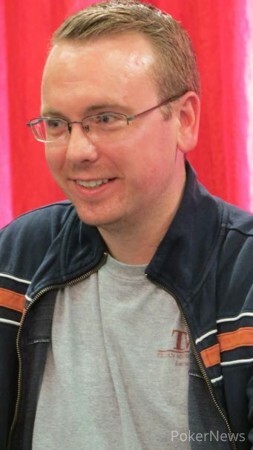 Helder would start his ascent when he eliminated Rhett Trusler in ninth place after his outran Trusler's . Helder and Nguyen, the other chip leader at the table, would tangle in a big pot that would send Helder above the ten million chip mark. Nguyen would flop trips but couldn't chase Helder off on the flop. Nguyen checked the turn giving Helder the chance to hit a Broadway straight on the river. Nguyen couldn't let his own big hand go and Helder would never look back at that point. Jonathan Gaviao could never get anything going and would end up being knocked out in sixth place for $90,881 when his was outdrawn by Rice's . With five players remaining, Chris Drake would go in with the worst of it and come out on top in a massive three-way pot that saw Nguyen eliminated in fifth place for $110,663. Helder would run away with the tournament when he took out Drake in a huge flip with his pair of tens besting Drake's ace-king. It didn't take long to get to a winner once play was three handed. World Series of Poker bracelet winner Kevin Eyster would fall to Rice when his ace-king failed to win a race against Rice's jacks. Heads-up play lasted just three hands with the final hand seeing Helder holding the dominant hand with against Rice's . Rice would not outdraw Helder and would have to settle for second place and $340,403. There were an impressive 1,323 entrants creating a prize pool of $3,175,200. Plenty of notables made deep runs into the money including La Sengphet (130th), Seneca Easley (110th), Rep Porter (98th), Christian Harder (92nd), Grayson Ramage (87th), Andy Philachack (73rd), Scott Clements (70th), Brandon Steven (68th), Lynn Samples (41st), Austin Lewis (32nd), Bryan Campanello (21st), and Joseph Cheong (13th). Others would fall short including WinStar poker ambassador Maria Ho, poker legend TJ Cloutier, Layne Flack, Tom Marchese, Kevin Saul, the 2012 champion of this event Aaron Massey, Kyle Bowker, and many others. This concludes our coverage of the 2014 WinStar River Poker Series Main Event. Thank you for following along with our coverage and stay tuned to PokerNews throughout the rest of the year for exciting tournament coverage across the globe. Travis Rice Eliminated in 2nd Place ($340,403); Jason Helder Wins! Hand #138: Jason Helder made it 400,000 from the button and Travis Rice folded his big blind. Hand #139 Rice completed from the button and Helder responding by shipping all in over the top. Rice folded. Hand #140: Helder made it 400,000 from the button and Rice moved all in for roughly five million in chips. Helder called and the hands were turned over. Helder had the lead and was five cards away from being crowned the champion. The flop came down , paring Helder's nine and giving him a tight grip on the hand. "Five of hearts for a sweat!" chimed in third-place finisher Kevin Eyster from the rail. The turn was in fact the , sealing the deal for Helder. The finished the board and Rice officially became the runner up for $340,403. Hand #137: Travis Rice raised to 450,000 from the button and it folded to Kevin Eyster who moved all in from the big blind for 2.25 million. Rice called and the hands were turned up. The two were flipping for Eyster's tournament life heading to the community cards. The flop came down , keeping Rice's jacks in the lead but giving Eyster a few additional outs to make a wheel. The dropped down on the turn, meaning Eyster needed to improve on the river in order to stay alive. The river was the , ensuring that Eyster would fall in third place for $219,088. 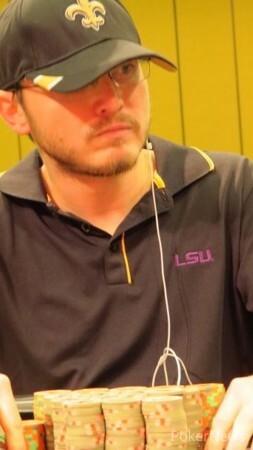 Hand #132: Jason Helder raised all in from the button and won the blinds and antes. Hand #133: Helder received a walk in the big blind. Hand #134: Travis Rice raised to 475,000 from the button and won the blinds and antes. Hand #135: Helder moved all in from the button and took down the blinds and antes. Hand #136: Helder received a walk in the big blind. Hand #129: Chris Drake opened for 100,000 and Jason Helder called out of the big blind. The flop came and both players checked. The turn was the and Helder led out for 500,000 and was called by Drake. The two checked the river and would chop the pot as Helder had and Drake . Hand #130: Kevin Eyster moved all in and won the blinds and antes. Hand #131: Travis Rice opened for 400,000 and Helder reraised to 950,000. Drake four-bet to three million and Rice quickly got out of the way. Helder moved all in and Drake snap-called and the two were off to the races with Helder holding and Drake . The board would run out to give Helder yet another big pot and eliminate Drake in fourth place for $134,096. Helder has 27 million of the 33 million chips in play after the hand. The remaining three discussing an ICM chop momentarily but decided to play on. Hand #124: Jason Helder opened to 400,000 from under the gun and Chris Drake made it 1.1 million to go from the button. Action came back to Helder and he called to see a flop. The dealer fanned and Helder check-called a continuation of 1.2 million. The hit the turn and both players checked, allowing the to finish the board. There were two more checks and Helder tabled a winning for a pair of kings. Hand #125: Drake made it 400,000 from under the gun only to have Travis Rice three-bet the action to 1.2 million from the small blind. Action folded back to Drake who folded as well. Hand #126: Rice limped his button, action folded to Drake, and he raised out of the big blind. Rice let his hand go. Hand #127: Helder opened to 400,000 and took down the blinds and antes. Hand #128: Drake made it 400,000 from the button and Rice called from the big blind. The flop came down and Rice checked. Drake fired 400,000 and Rice moved out a call. Fourth street was the and on this street Rice check-called for one million. The on the river put two pair on the board. Rice checked, Drake shipped all in, and Rice folded. Hand #119: Travis Rice moved all in first to act for 2,020,000 and was quickly called by Jason Helden. Rice had and Helden . It was over quickly as the flop came and after the on the turn, Helden joked "I don't like my chances." The river was a meaningless . Rice doubled up to approximately 4.25 million. 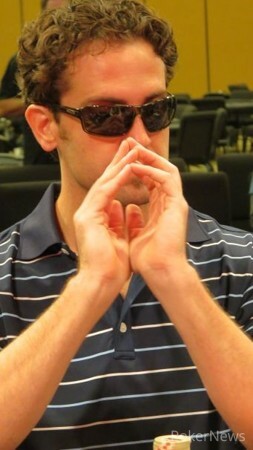 Hand #120: Kevin Eyster moved all in from the small blind and Rice folded his big blind. Hand #121: Rice moved all in from the small blind and Helder folded his big blind. Hand #122: Rice raised to 425,000 from the button and was called by Helder and Chris Drake out of the blinds. The flop came and Rice would take the pot down with a 670,000 chip bet. Hand #123: Helder raised to 400,000 and picked up the blinds and antes. Hand #113: Chris Drake raised to 400,000 from under the gun and it folded to Jason Helder in the big blind. He made the action 1.3 million to go, prompting a fold from Drake. 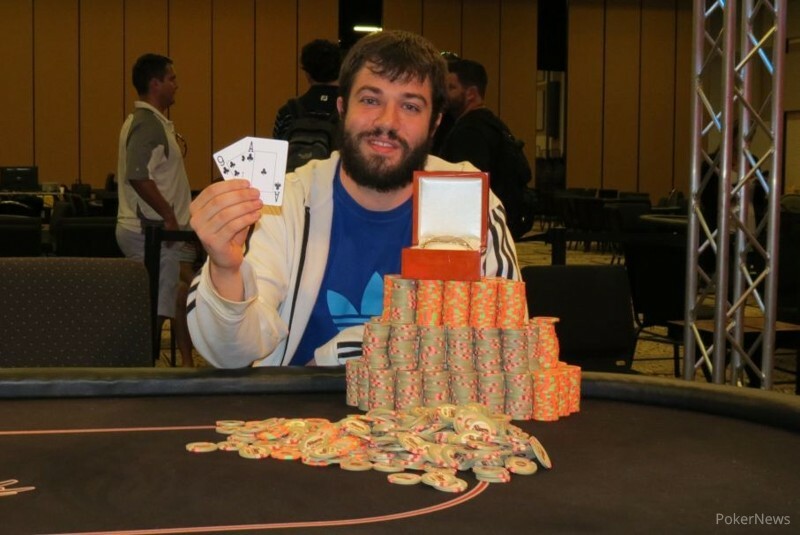 Hand #114: Kevin Eyster raised to 400,000 from under the gun and won the blinds and antes. Hand #115: Helder made it 400,000 from the button and won the blinds and antes. Hand #116: Helder made it 400,000 from the cutoff and won the blinds and antes. Hand #117: Drake was first to act and raised to 400,000. Action folded to Helder's big blind and he flatted. The flop hit the felt and both players checked. The turned, Helder fired, and Drake released. Hand #118: Action folded to Helder small blind and he completed. Drake checked his option and the duo checked down an entire board of . Helder showed for queen-high, which was good enough to take down the pot.